Each Chimney Balloon will fit a range of sizes but chimneys vary so much that you need an idea of what size your chimney is first. 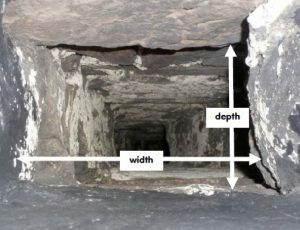 For oblong and square chimneys, measure side to side and front to back. If there’s a fire surround, measure the chimney beyond this. If you’ve got a headtorch, it’s useful for keeping your hands free to measure. If you’ve got ski googles it will stop soot falling in your face. Just remember your balloon will soon be keeping you nice and warm and it will last for years so it’s worth taking a bit of trouble at this stage to make sure you get the right size. Now have a look at the sizing chart and see which size Chimney Balloon is suitable for you. If there isn’t a standard one that fits then get in touch as we can do bespoke ones for you. The Chimney Balloon should fit snugly against 4 sides of the chimney without fretting or rubbing. It should be somewhere you can easily reach with the pump or mouth inflation tube. If you need to fit it higher up then you will need to purchase an extension pipe. Make sure the tap is open and pump some air into the balloon so that it starts to inflate. Once you’ve got a bit of air in it, put it in position to inflate it fully. If you have a cast iron fire surround make sure you can push it through the small gap before positioning it in the chimney to fully inflate it. While you’re inflating it make sure it’s correctly positioned. It will move a little to where the chimney is widest. Inflate until the balloon is gently firm but not drum-taut. Please don’t over-inflate it. Then close off the tap. If you’ve used the mouth inflation tube then the balloon will contract a bit as it cools. Once the balloon has gone down a little, top it up some more. Make sure the hand-grip is hanging free without being pushed up against any obstacles. If you are fitting it in a windy area where there is a strong updraught then it’s a good idea to tether the Chimney Balloon® to the grate with a piece of string to make sure it doesn’t get sucked up the chimney. Open the tap and let the air out before carefully removing the Chimney Balloon®. It’s made of tough plastic but it doesn’t like being scraped against rough chimney walls too much. If you’re leaving it in place for a long time then check it every 3 months or so to make sure it’s still fully inflated. Take it out once a year to make sure there’s no accumulated debris above it. 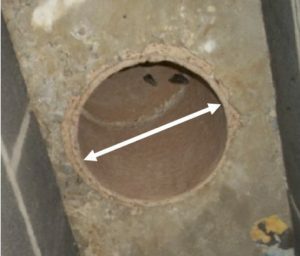 Sometimes over time friction against a rough chimney surface can cause small holes to occur. In this instance make sure the hole is clean and dry then simply stick a piece of adhesive tape over it. Make sure there are no wrinkles for air to trickle through. If a fire is accidentally lit with the Balloon in place, it will quickly shrink and fall into the grate.